He was the delight of all the associatesof the great PRABHUPADA Sarasvati Thakura. He was the favorite of his Godbrothersand he gave them all his laughing Hare Krsna! In 1968 paramahamsa Akincana Krsnadas BabajiMaharaj was staying at Srila Vana Maharaj's Vrindavan Gaudiya Matha, bhajankutir, which he did every year for 4-5 months at a time before and duringthe hot season. In the winter he was in Navadvipa. We slept on the rooftogether many summer nights, and he never went to sleep. Prayers, quietbhajan and chanting all night long, every night. He was constantly laughing,and he would always say Hare Krsna! with the greatest exuberance I haveever witnessed. He was the most 'Goswami' alike character.He looked just like you would imagine Sanatana or Rupa Goswami in Vrajato look like. He was the only devotee I ever witnessed who would weep flowingtears while leading kirtan without losing his voice. And he was the greatestkirtana leader in the universe! All the devotees within the various GaudiyaMath's everywhere agreed that Lord Caitanya would personally join BabajiMaharaj's kirtana. As long as he stayed at Srila Vana Maharaj's Vrindavanashram he always led the kirtana starting at 4:30 am. He always playedthe mrdanga either in kirtan or alone while singing prayers before theDeities. The Deities at bhajan-kutir were Lord Caitanya,Sri Govinda in the center, with Srimati Radharani on the other side. Therewere also Govardhana and Shalagram shila's worshipped daily with the centralDeities. The puja standard was first-class. There were about 10-15 ashramitesranging in age from 18 - 80 years old. Everyone was either a brahmacarior sannyasi. Akincana Krsnadas was the only "Babaji" who stayed regularlyat the Vrndavana bhajan-kutir except for Srila Vana Maharaj's Babaji discipleSri Lalit Babaji who returned to Vraja nitya-lila in 1972. In the daytime, after noon kirtana, KrsnadasBabaji Maharaj would go down into a cave room which Swami Vana had constructedyears before. Srila Vana Maharaj was known to have performed solitary Vraja-bhajanin this basement room for a number of years before he accepted disciples.It was very cool in that room. So everyday Babaji Maharaj would spend theentire afternoon in the cave room chanting his mala. Babaji Maharaj didn't seem to have any teeth.He was an old Bengali disciple of Saraswati Thakura's who (it is rumored)went to live in seclusion at Haridwar after the disappearance of Prabhupadaand the following trouble within the Gaudiya Math. In any case, that wasmany, many years before. He was about 70 years old when I first receivedhis merciful glance. 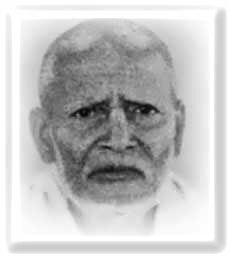 Making disciples, building temples or collecting moneywere the farthest thing from his mind; and he never, ever criticized anyone.His only concern was chanting constantly; either kirtan or rounds. He wouldanswer with a laughing "Hare Krsna!" any time anyone would speak to him.He often had a gleefully pained look on his face like he had just heardthe world's funniest joke and was going to burst out laughing. And whenany one said Hare Krsna to Babaji he would laugh out loud in a most infectiousmanner. When ever he would say Hare Krsna he would laugh his way throughthe mantra. I have never seen Prema-bhakti as exhibited by Krsnadas BabajiMaharaj. All the Gaudiya Math devotees were so glad when Babaji Maharajwould come to stay. Time for the uttama kirtana! In 1968, for protection from my Vietnam draftlegal problems, I proceeded to Govardhana Hill on the order of Srila VanaMaharaj to perform parikrama. By some good fortune I was accompanied byBabaji Maharaj who also wanted to visit Govardhana. On the way we stoppedat Nandagram where we stayed for a week at Sanatana Goswami's bhajan kutir(no electric, water, nor latrine). Begging "madhu-kari" from the localVraja-vasis by proclaiming, Radhe Syama!, we passed our time in chantingand exploring the home of Nanda Maharaj. Babaji Maharaj didn't speak anything(he only said "Hare Krsna! "), nor did I speak much Bengali yet, so ourrelationship was initially based on only saying "Hare Krsna!" to each other. Next we proceeded to Varsana where he introducedme to Sriji Herself. But due to my blunt material eyes I could only seecharming Deities. We also stayed a few days at Man-mandirawith a siddha-purush known as Radha-charan Das Babaji. He is oneof the most exalted souls I have ever met, and as of 1996 he has residedthere for 46 years. After many days we finally arrived at MountGovardhana, but we got off the bus (at Babaji's insistence) before thebus drove over the hill and on to the bus station. Early the next morning,after bathing in Syama kunda & Radha kunda, we walked around Govardhanahill barefoot, carrying our bedding, chanting all the way. Sometimes BabajiMaharaj, while always chanting, would laugh out loud and other times heseemed morose like he was missing Krsna. Just like Srila Prabhupada, BabajiMaharaj never wasted a single moment without Krsna Consciousness. By eveningwe had completed the task and returned safely to Radha-kunda for the night.The next day we went back to Mathura by bus and onwards to Vrndavana byTonga. Sanatana Goswami's sacred bhajan-kutir ison the banks of the eternal Pavan-sarovar lake. This kunda is so specialbecause Sri Krsna takes His daily bath here eternally. It is said thata morning bath in Pavan-sarovar gives liberation from material bondageforever (at least a shira-snan). All the devotees would bath daily in thissarovar. It is very charming. Attached to this austere ashram is a verysacred tirtha, the samadhi of Akinchan Krsnadas Babaji Maharaj, who isa real bhajan-anandi. Nandagram is the lila-stali chosen over allothers by Babaji Maharaj to leave his old body. Some devotees believe thatBabaji Maharaj is eternally in shakya-rasa with Lord Krsna. Althoughhe would never say, still, I remember him at Madhuvana singing a Hindisong about Krsna's friends with tears streaming down his face. In the samadhi is a large picture of BabajiMaharaj looking kind of pained. I have never exactly seen Babaji with thatlook before. I always remember him laughing and very happy. He was so humblethat we were all afraid to offer him obeisance's because he would alwaysdo the same in return. He would never accept obeisance's. Can you imaginea Vaisnava of Babaji's character bowing to a prakrta-bhakta and formerbeef-eater like me? I wasn't fit to wash his feet. Please allow me to speak more about AkinchanKrsnadas Babaji Maharaj. One time he was leading a large sankirtana partythrough the streets of Vrndavana. It was the middle of summer (In Vrndavana!! ).When we reached Srila Bhakti Saranga Goswami's Gaudiya Math, Babaji Maharajfainted. We all thought he might die, so we continued chanting and tookhim into Bhakti-Saranga Maharaja's Amalitala ashram. Finally we got BabajiMaharaja to wake up and then he got sick to his stomach. When he felt alittle better he asked us to continue on and he would catch up later. Sureenough, on the last stretch, there was Babaji Maharaj with mrdanga in handand a beaming grin on his face. On another occasion I was following BabajiMaharaj walking around Giriraj Maharaj. In all the years together I neverheard Babaji Maharaj speak much. Example: "Babaji Maharaj, is it true thatyou're in shakya rasa?" To which he replies, "HARE KRSNA!!!" Even whenhe was meeting with his Godbrothers he would always sit at their feet,and he would simply laugh and proclaim, "Hare Krsna!!!" whenever he wastold anything. So we were walking past a devotee who was performing 108dandavat parikrama around Govardhana when suddenly Babaji Maharaj turnedto me and said, "Ucharan Koro!" ("Pronounce it"---the Holy Name). My chantingwas so poor that Babaji Maharaj had to break his silence. As I mentioned before, Babaji Maharaj neverslept. He was always up all night performing bhajan; at least during thesummers when he would always stay in Vrndavana with Srila Vana Maharaj.First thing in the morning Babaji Maharaj would lead all the kirtana withall the many traditional Gaudiya Matha melodies. Then, after Caitanya Caritamrtareading (in Bengali), Babaji Maharaj would sit alone before the Deitiesand sing endless sweet bhajan's for a few hours. He would also sing (recite)so many verses, and he would always begin with all the Guru vandanas, Siddhanta-Sarasvati,Gaura Kishore, etc. During the afternoon he would stay in Swami Vana'sunderground room to chant. I often went down to serve him and I never sawhim sleeping. At night he would again lead the kirtana, and after prasadamhe would sit on the roof to pray, all night! The best way to describe BabajiMaharaja is a laughing "Hare Krsna!!"